Whether you are a seasoned Objective-C developer or new to the Xcode platform, Swift Essentials will provide you with all you need to know to get started with the language. Prior experience with iOS development is not necessary, but will be helpful to get the most out of the book. Familiarity with compiled languages is assumed. 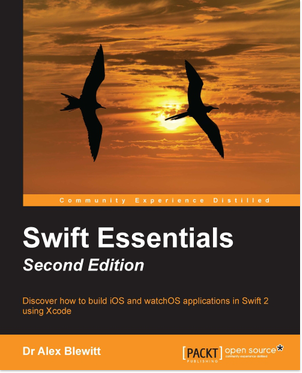 The Second Edition has been updated to use Swift 2.x syntax and examples, and adds support for running the repository browser on the Apple Watch. 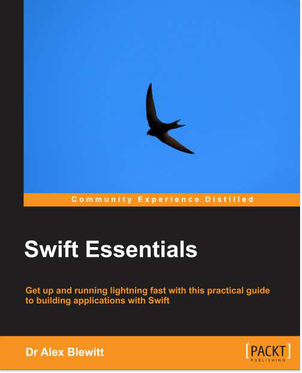 Special Offer To celebrate the launch of the Swift Essentials book, and the release of Swift 2.2, a special code SSEE50 will give 50% off the eBook, while SSEE30 will give a 30% discount on the print book from the Packt website. These codes are valid until 31st March. Playing with Swift demonstrates Swift Playgrounds as a means to interactively play with the Swift code and obtain graphical results. It also introduces the playground format and shows how playgrounds can be created automatically from Markdown and AsciiDoc files. Creating an iOS Swift App shows you how to create and test an iOS application built in Swift using Xcode, along with an overview of the Swift classes, protocols, and enums. Storyboard Applications with Swift and iOS introduces the concept of Storyboards as a means to create a multiscreen iOS application and shows how views in Interface Builder can be wired to Swift outlets and actions. Creating Custom Views in Swift covers custom views in Swift using custom table views, laying out nested views, drawing custom graphics, and layered animations. Parsing Networked Data demonstrates how Swift can talk to networked services, using both HTTP and custom stream-based protocols. Building a Repository Browser uses the techniques described in this book to build a repository browser that can display information about users' GitHub repositories. Exploring Swift presents the Swift read-evaluate-print-loop (REPL) and introduces the Swift language through examples on standard data types, functions, and looping.